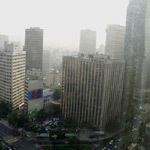 3 September 2008: Seoul, the capital of South Korea, is a typical mega city: vast, pulsating, noisy and full of exhaust fumes. This is the setting in which researchers from the German Fraunhofer Institute are developing new building concepts and IT solutions. which will save energy, cut pollution and make living in the city a more pleasant experience. Housing as far as the eye can see  Seoul is one of the world’s mega cities. South Korea’s capital city has undergone exponential growth over the past few decades: Its population has quadrupled in fifty years. Ten million people live within the city boundaries today. If the count is extended to cover the metropolitan region surrounding the city, it comes to over 20 million. The population growth has had a dramatic impact on the environment, bringing about a huge increase in traffic noise and air pollution. Seoul Mayor Oh Se-hoon is no longer willing to stand by and watch this happen. If things go as he would like them to, Seoul will soon be a green city with clean air  a role model for other mega cities that are contending with similar problems. The city is investing in innovative technologies and building projects, and it is supported in its ambition by Fraunhofer, one of Europe’s largest research and development institutions. On 3 September 2008, a Fraunhofer Representative Office opened in Seoul to coordinate projects between the Institute and its Korean partners. One of its core activities will be to develop technological concepts that make life in tomorrow’s mega cities easier, kinder and more pleasant to the environment. Researchers at the Fraunhofer Institute for Solar Energy Systems ISE in Freiburg are now developing an energy-efficient prototype building on behalf of the city of Seoul. It will be designed to incorporate all the principles of modern energy-saving technology, and will be heated and cooled using sustainable energy sources. Professor Volker Wittwer, deputy director of the ISE said that the building would show the population what kind of potential there is for using renewable energy. “We are planning to build seminar rooms, research facilities and private dwellings that will demonstrate the technical possibilities for gaining energy from sustainable sources, but also for saving energy,” he explained. Construction work on the new building is to begin next year  in time for the annual convention of the mega city working group in Seoul. “Our goal is to produce an exemplary building that will provide an incentive for industry to invest in low-energy technology,” adds the researcher. In the ‘zero-energy house’ project, team from Freiburg is contributing its know-how on the utilization of alternative energy sources such as sunlight, geothermal heat, or wind. The quality of living can be improved even in existing buildings. In the spring of 2008, scientists from the Fraunhofer Institute for Building Physics IBP in Holzkirchen (Germany) signed a cooperation agreement with Samsung Engineering & Construction, one of the largest construction companies in Korea. “We are aiming to increase the comfort and energy efficiency of residential buildings,” reports IBP-reseacher Dr Andreas Holm. Over half the population of Korea today live in high-rise apartment blocks that were built in the last few decades. By German standards, these buildings are poorly insulated. The residents require a great deal of energy to heat or cool the rooms. Overheating in summer and the growth of fungus are also a problem. The causes are now being systematically examined. By the end of this year, the researchers from Holzkirchen will have equipped 24 apartments in Seoul with sensors that monitor temperature and humidity 24 hours a day. With the aid of these readings, the experts can simulate the indoor climate and make recommendations on how to increase energy efficiency and comfort. “Our goal is to cut the loss of energy even further by using better-insulated windows and facades, at the same time creating a pleasant indoor climate for the residents without unnecessarily pushing up the costs. We are keeping the mass market in mind,” sums up institute director Professor Klaus Sedlbauer. One highly critical research topic in Seoul is soundproofing. The traffic in the streets of the capital city produces an incessant background of noise, and the high-rise blocks are not well soundproofed. New laws are now to give the citizens more peace and quiet. A new regulation on reducing impact noise  which is incidentally far more stringent than the regulations applicable in Germany  has been in force since 2006. Services for citizens is another area in which the city of Seoul plans to employ state-of-the-art technology in future. The objective is to make dealings with public authorities simpler, more convenient and less complex. “The National Information Agency NIA is developing special IT services for the government which will not only provide information and reproduce application procedures online, but will also directly involve the citizens themselves and accept their inquiries and reports,” explains Nils Barnickel of the Fraunhofer Institute for Open Communication Systems FOKUS. In collaboration with Korean IT experts he is currently planning a research project in the field of telephone-based e-government services. The two sides have signed a memorandum of understanding in which they have agreed to develop a range of services for the mega city that will be similar to the planned service hotline in Europe. In future, all European citizens will be able to obtain comprehensive information and assistance in their dealings with public authorities, including the end-to-end handling of application procedures, simply by calling 115. Seoul would like to offer this attractive service to its own 20 million citizens.